Brain Gym is a set of 26 movements aimed at integrating the two halves of your brain. It was developed by Paul Dennison to help himself with learning challenges when he was a post-secondary student. Seeing the potential to help others, he and his wife, Gail Dennison, developed the Brain Gym program. They found that people doing these movements experienced improvement in a number of areas, including concentration and focus, memory, physical coordination, and organization skills. The photo is my copy of the original book. 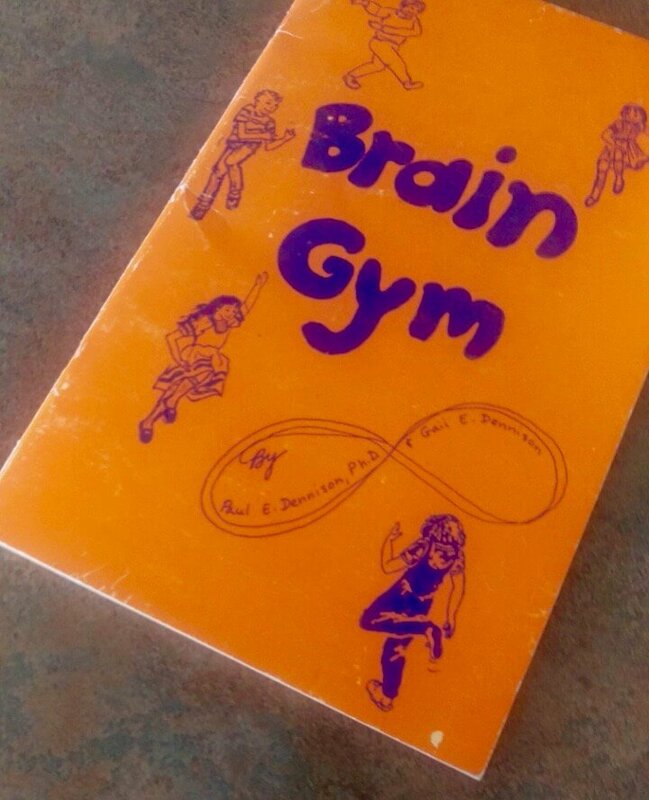 It is still available on the Brain Gym Bookstore. It is well known that the brain has two halves—left and right. The left side is the logical mind that sees things in detail and analyzes in a linear way. Your right brain has an entirely different, and complementary, job. It takes a holistic view, looking at the big picture rather than details. If you are deciding what diet to choose, it’s the left brain that researches and generates the list of possibilities you could try. And it’s the right brain that puts you in touch with what would work best for your own body. In other words, your right brain takes the long view to help you make choices that will contribute to the kind of life you want to live. The left brain thinks through the details about how to make it happen. We need them both, working together. That would be true if we weren’t in times of such dramatic change. The thing is, now we can’t afford to use less than all our resources. The left brain is necessary, but no longer sufficient. According to Daniel Pink, author of A Whole New Mind, the ability to engage both sides of the brain will greatly contribute to success in life and career in the midst of the change we are experiencing. For nearly a century, Western society in general, and American society in particular, has been dominated by a form of thinking and an approach to life that is narrowly reductive and deeply analytical. Ours has been the age of the “knowledge worker,” the well-educated manipulator of information and deployer of expertise. But that is changing. Thanks to an array of forces—material abundance that is deepening our non-material yearnings, globalization that is shipping white-collar work overseas, and powerful technologies that are eliminating certain kinds of work altogether—we are entering a new age. It is an age animated by a different form of thinking and a new approach to life… Today, the defining skills of the previous era—the “left brain” capabilities that powered the Information Age—are necessary but no longer sufficient. And the capabilities we once disdained or thought frivolous—the “right-brain” qualities of inventiveness, empathy, joyfulness, and meaning—increasingly will determine who flourishes and who flounders. For individuals and families, and organizations, professional success and personal fulfillment now require a whole new mind. To play nicely together, the right and left brains must communicate with each other. This occurs through the corpus callosum, the bridge between them. Brain Gym is designed to facilitate communication between the two sides of the brain. 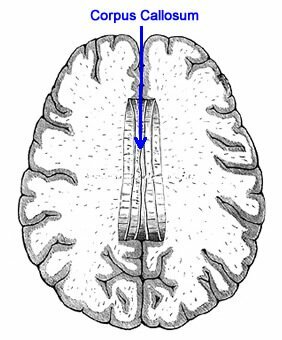 Several of the brain gym activities are referred to as “midline movements” because they cross the midline of the body and thus activate left-right communication. If you’re curious what that would look like in action, here’s a teacher leading students through a few of these midline movements. Over the years, other practitioners have incorporated whole-brain integration into their work. Donna Eden, a pioneer of energy medicine, includes brain gym elements in her daily energy routine. And if you look back at the SuperBrain Yoga demonstration, you’ll notice that the hands are positioned to cross the midline, rather than holding the ears on the same side of the body. Brain Gym, Donna Eden’s daily energy routine, and SuperBrain Yoga are all things we can easily do at home without special equipment. They have all been shown to help our brains work as they are meant to. And it costs nothing to try. How does it get any better than that?! This entry was posted in Information, Action & Being Resourceful, Things to Try, All Posts—newest first and tagged Psych-K, Edu-K, Brain Gym, Donna Eden, left brain, right brain, whole brain, Dan Pink, corpus callosum by Laurana Rayne. Bookmark the permalink. These exercises took me back to my many years of participation in Fitness classes called Stretch and Strength. To see them used in Brain Gym is fascinating and rewarding! What goes around comes around, as the saying goes. Indeed! I couldn’t have said it better myself. Thank you Laurana. I’m really enjoying these blogs.